Halloween is like the kickoff for the holiday season. It’s a fun chance for kids and adults to dress up eat candy and even share some chills and thrills. Along with planning parties and creating costumes it’s important to revisit Halloween safety considerations particularly since many festivities take place at night. Plan your route in advance and stay with an adult or at least let one know where you will be going. Cross the street at a crosswalk or corners — never in-between cars — and do not run out into the street. Look both ways and cross as a group. It’s a good idea to carry a cellphone in your pocket in case you need it but keep your eyes off of electronics while walking. Discuss with your parents when you should call 911 or who you should call if you get lost. Carry a glow stick flashlight or lantern so drivers will be able to see you. Also add reflective tape to your costume and treat bag to make yourself more visible. Only approach homes with lights on and never go into a stranger’s house or car to get a piece of candy. Consider fire safety. Luminarias pumpkins and spooky candles can be situated in unexpected places like the edges of driveways. Put your candles in a safe place away from foot traffic — and dress your children in well-fitting fire-resistant costumes. Electric candles are safe alternatives to using an open flame in jack-o’-lanterns. Clean up the walkways around your home. Remove wet leaves snow garden hoses bikes and other tripping hazards. Resist the temptation to use cosmetic contact lenses without a prescription. These contacts may look great but the U.S. Food and Drug Administration warned that they can result in irritation infection and in extreme cases permanent blindness. Use makeup instead of masks and make sure props are not sharp or heavy enough to cause an injury. 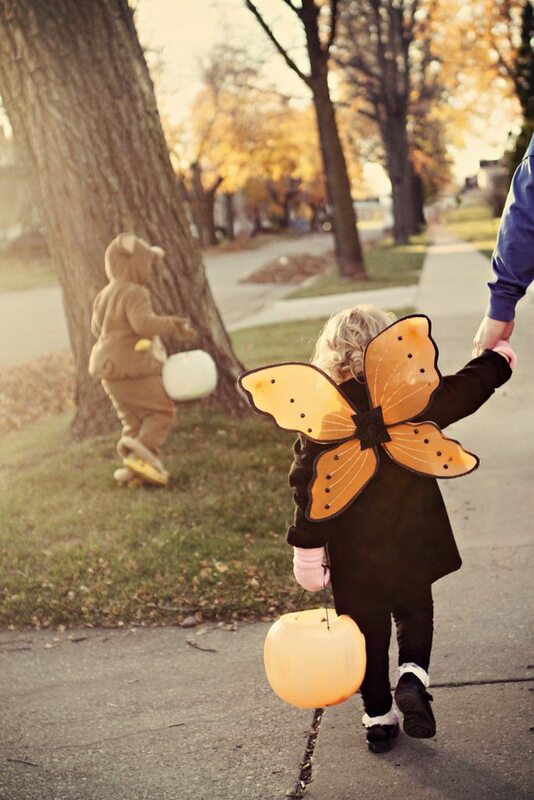 Peak trick-or-treating hours are typically from 5:30 to 9:30 p.m. so drive slower in residential areas during that time paying extra attention for kids who may be trying to cross the street. Reduce or remove distractions so you can focus on the road. Be especially aware when entering and exiting driveways and alleyways. Discuss Halloween safety with your kids friends and neighbors so everyone can have a spooky fun and festive night free from any real danger.